I've never understood the point of racing. Don't get me wrong, the rush of touching maddening speed isn't lost on me. But how can you be entertained watching a bunch of guys going round and round in circles? So imagine my surprise when I, out of all the MotoGP fans in the ZigWheels office, was nominated to cover the last round of the season in Valencia. What were PD and Kartik even thinking? Why was I chosen? How can I even do justice to such a thing? Do I even deserve to be here? The guilt was overwhelming. And If I’m being completely honest, I was more excited about my first international trip rather than experiencing MotoGP in person. But then (as cheesy as it sounds), it started to make sense when I landed in Spain. There are three instances that are still stuck with me, almost three months later. First being outside a rest stop just outside Valencia. A big group of bikers had just rolled in, blasting music on their Harley’s. Now, I’ve seen enough Sons Of Anarchy to be wary of such situations, but the “explorer” in me decided to strike a conversation with one of the older riders in the group. Now, with my non-existent Spanish and his broken English, the conversation was limited to sign language, repetition and a few keywords. From what I understood, or at least what I think I understood, this gentleman had been coming to the Circuit Ricardo Tomo every year since 1999. First with friends, now with his son. That’s when it first hit me. It’s not just entertainment for them. It’s a tradition. The second instance is memorable for me personally. You see, I think there is a moment of magic in every sport that just hooks you and never lets you go. Watching David Beckham score an impossible freekick to put England in the semi-final of a World Cup made me a football fan. Watching Sachin Tendulkar score 200 against South Africa instilled my faith in cricket again. In Valencia, it was watching Marc Marquez that made the same impact on me (sorry Arun). 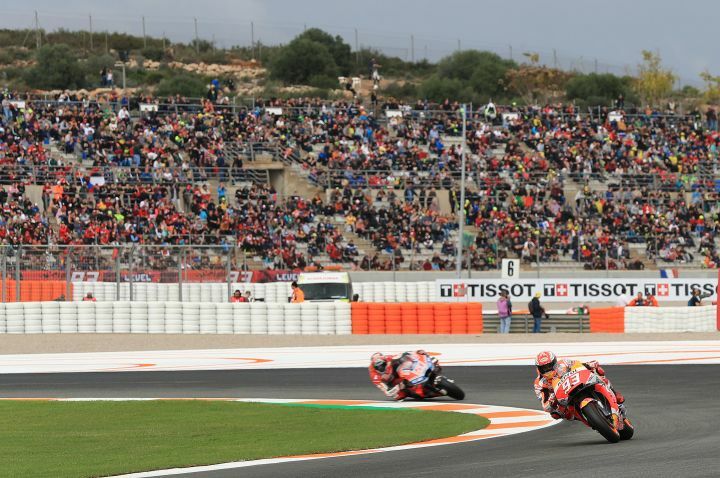 It had started to pour badly in Valencia that weekend. Although most of the track was dried-off, there were some wet patches that could’ve caused problems. Marc being Marc, had gone flat-out not knowing (or knowing?) how dangerous it was. While he did make a decent effort fighting the laws of physics, the outcome was inevitable. A crash which let out a loud gasp from the media centre and me experiencing phantom pain in my shoulder. “There’s no way the kid’s going to compete today” I remember saying to a fellow journalist, only to see him riding out of the pits 20 minutes later, leaving our jaws dropped, quite literally. By the time the race had started, it had started to really pour. This wasn’t Mumbai ki baarish where it feels like taking a hot shower with a semi-broken water-heater. I was in Europe. In November. Without any winter clothes. Every drop felt like being hit by a frozen needle. While that was enough for my fellow journalist to sprint to the media room, I decided to stay back. I had to stay back. To smell the burning rubber, to listen the deafening sound these bikes make, to see this synergy of man and machine, all sending shivers down my spine. Yeah, I know how cheesy it sounds. To be honest, the feeling is indescribable. I never expected to watch a race to its completion, yet here I was at the other side of the world, drenched from head to toe, freezing my nuts off, watching a bunch of guys going round and round in circles. I was hooked. Right, the third instance. At the end of the weekend, I was one of the very few journalists in the world to attend Dani Pedrosa’s last press conference as a MotoGP rider. I’m not going to lie here, anxiety got the better of me. I couldn't even process a thought, let alone formulate a question that was worth asking someone with as calibre as him. So I didn’t. Was this a newly found respect? Yes. Seeing what these guys were ready to do in such horrible conditions to win was enough for me. I had come to Spain with the intention of exploring the place. MotoGP was merely a second thought. Ironically, at the end of the journey, after falling for all the tourist traps, I felt sadder leaving Valencia. Now coming back to the burning question - why did PD and Kartik choose me of all people to attend the event? To be honest, I don’t care. But I am glad they did.